Journaling completed with the guidance of Great Cameo Narratives by Denis Ledoux (www.turningmemories.com). 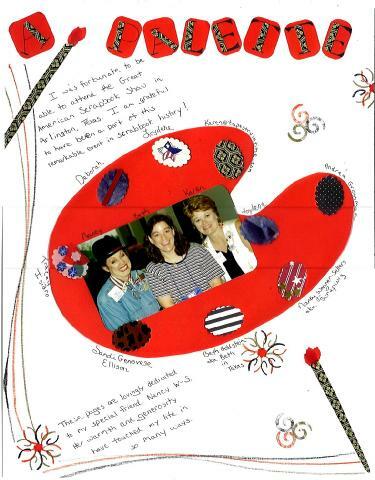 "I was fortunate to have been at the Great American Scrapbook Convention in Arlington, Texas in June of 1999. I am so grateful to have been a part of this remarkable event in scrapbooking history! The opportunities were there to experience oodles upon oodles of fabulously friendly people, the latest and the greatest new products, fresh ideas, and distinguished industry professionals. I left Arlington exhausted and exhilarated. I walked away with a bigger heart, an inspired mind, and a tiny glimpse of heaven on earth. This page is lovingly dedicated to my special friend Nancy Wagner-Sellers. Her warmth and generosity have touched my life in so many ways.